Keeper Blog: Happy Half Birthday Jaya! Friday the 13th is a good day for the zookeepers. 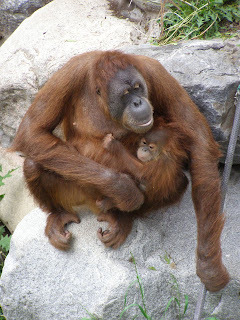 Today Jaya the male orangutan turns 6 months old! He had a precarious start, being born by C-section at the University of Minnesota and being raised by zoo keepers for the first 12 days of his life. We held him around the clock wearing a fake fur vest for him to cling to, feeding him bottles of formula and recording notes on his bowel movements, urination, and hiccups. The late night shifts made it particularily tough to stay awake as you watched him snooze on your chest so peacefully. Finally on Christmas Day, he was successfully introduced to his mother. We are all glad to see that he has grown and thrived in the first 6 months. Jaya will now venture away from mom Markisa for short periods climbing ropes or the mesh of the holding area, as well as put everything into his mouth, much like human infants. He is one of the cutest babies I've seen in a while. The orangutans are now on their outside exhibit and can usually be found lounging with fabric or a swimming pool over their heads for relief from the busy day. They do have the ability to go inside if they choose, so if you don't see them outside, they'll be inside hamming it up in front of the exhibit glass.